Bitcoin Cash (BCH) continues to stand out as the best performing cryptocurrency in the top 10 during the recent bull market frenzy, which has seen the global crypto market capital swell by $30 Billion in the last 48hrs. Bullish support hailing largely from Asia appears to be the main driving force behind Bitcoin Cash’s rapid ascent, with Huobi Global currently accounting for 8.67% of all BCH trades. Renowned Bitcoin Cash proponent, Roger Ver, recently announced on Twitter that BCH merchant adoption in Japan has now surpassed the number of stores that accept BTC - highlighting Japan’s growing predilection for the forked Bitcoin project. 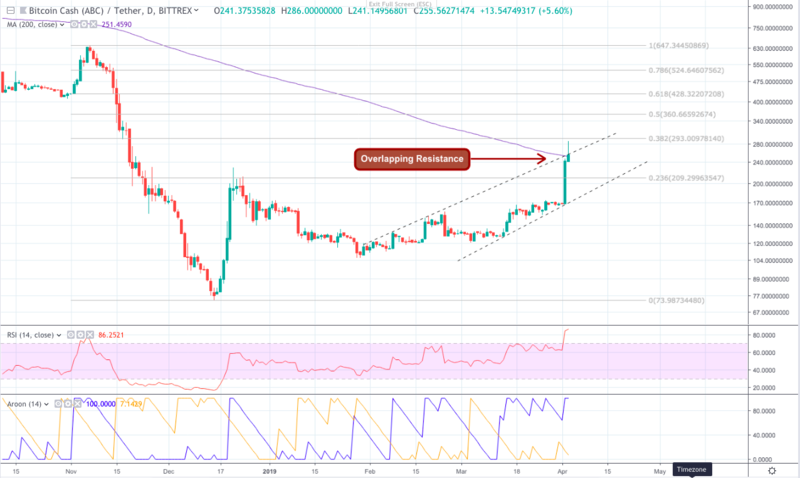 Today, the 6th largest crypto has secured a further 38% gain against the US dollar but bullish traders appear to be exhausted as they fail to hit the psychological $300 target. Two overlapping resistances seem to have stalled the upside trend for now, and has forced BCH to retreat back to $250. Will Bitcoin Cash be able to continue its impressive run and reach a new 4-month high, or is this as far as BCH will go? Let’s take a look. 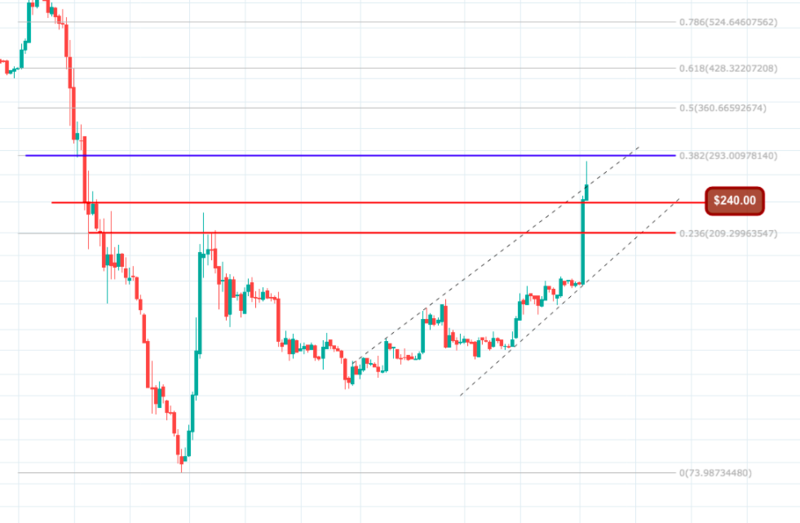 On the 1D BCH/USDT chart, we can see that the asset is still tracking inside an ascending channel that formed around January 29. During this morning’s Asian trading session, BCH briefly broke out towards a 0.382 fibonacci retracement at $293, but buyers seemingly lost confidence as the asset closed in on the milestone $300 level and quickly withdrew. From there increased selling pressure continued to drive BCH price down and back into the ascending channel. Right now the main resistance of this channel has doubled up with the 200 SMA creating a strong barrier preventing BCH from starting an upside recovery. The asset will be relying on the European trading session to inject new buying momentum into the price action and find support above $260. Looking at a number of 1H indicators we can see that selling momentum is still dominating the BCH market right now. If support doesn’t arrive soon, it is likely that BCH will continue to unravel down to lower supports. There is a bearish divergence between the 12 and 26 moving averages on the MACD indicator. The RSI has returned back into the index channel, and is continuing to fall. Parabolic SAR dots are appearing above the price action. The Aroon Up line has almost met with the Aroon Down line. All ROIs are calculated from the asset’s current value at $258.00 (AToW).